Planning your Mishlochei Manot? This Purim, do something different that will make a difference. 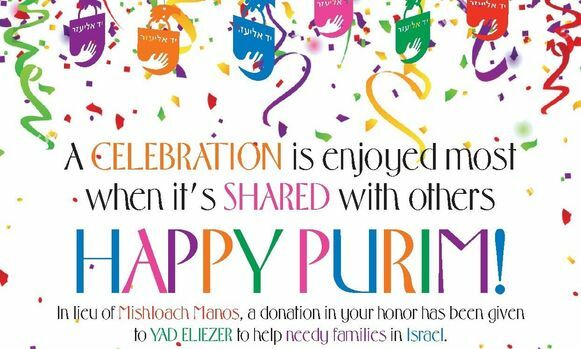 Send Yad Eliezer's Purim cards to family and friends! Funds from each card sold will go directly to the needy, helping them buy the essentials so they can celebrate the holiday with dignity and be "marbin b'simcha", too. Cards (including envelopes) are available in English and Hebrew and can be shipped throughout the United States and Israel. (At checkout, please specify in the comments box which number Purim card you would like to order.